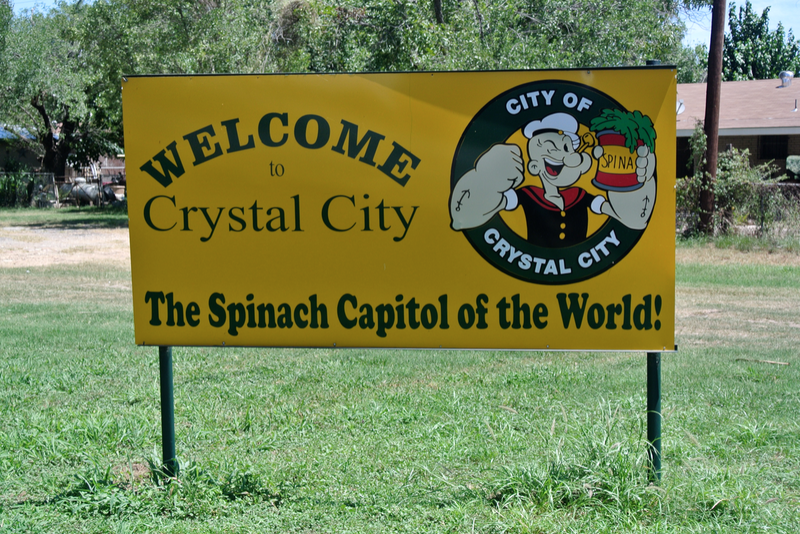 Crystal City Spinach Sign. Image available on the Internet and included in accordance with Title 17 U.S.C. Section 107. 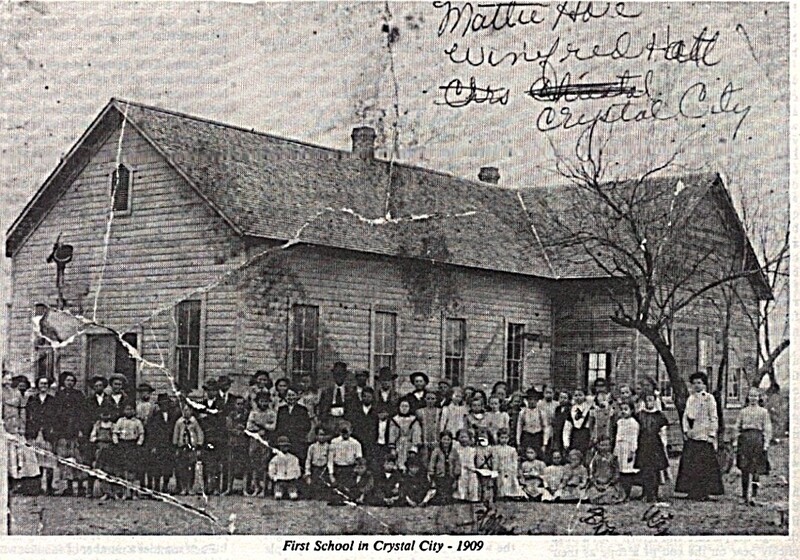 Crystal City school (circa 1909). Image available on the Internet and included in accordance with Title 17 U.S.C. Section 107. Popeye statue outside Crystal City city hall. Courtesy of Val Craig Photohgraphy. Image available on the Internet and included in accordance with Title 17 U.S.C. Section 107. CRYSTAL CITY, TEXAS. Crystal City, the county seat of Zavala County, is at the intersection of U.S. Highway 83, Farm roads 393, 16, 1433, 65, and 582, and the Missouri Pacific Railroad, one mile north of the Dimmit county line in south central Zavala County. Two land developers, Carl F. Groos and E. J. Buckingham, developed the town in the early 1900s. In 1905 they purchased the 10,000-acre Cross S Ranch, sold off most of the land as farms, and platted the townsite of Crystal City, named for the clear artesian water of the area. The town received a post office in 1908, the same year the Crystal City and Uvalde Railway provided the first rail service to the community and the first school building was erected. Crystal City was incorporated in 1910, when it had an estimated 530 inhabitants, and by 1914 the community had a bank, three general stores, and the weekly Chronicle. In 1928 the county voted to make Crystal City the county seat, and that same year the community added a city manager to its mayor-council government. As soon as the railroad reached Crystal City, the community became a major shipping point for winter vegetables. At first onions were the major crop, but by the 1930s the city developed a reputation as the "Spinach Capital of the World." 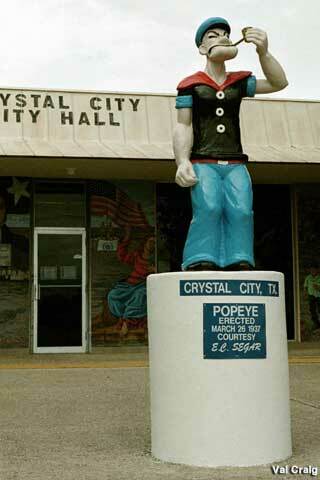 In 1936 the first annual spinach festival was held, and the following year a statue of the cartoon character Popeye, that mighty consumer of spinach, was erected across from the city hall. Carrots, tomatoes, peppers, and other vegetables were also marketed, and a vegetable cannery was opened in 1932. Crystal City Internment Camp. Courtesy of the Texas Historical Commission. Image available on the Internet and included in accordance with Title 17 U.S.C. Section 107. 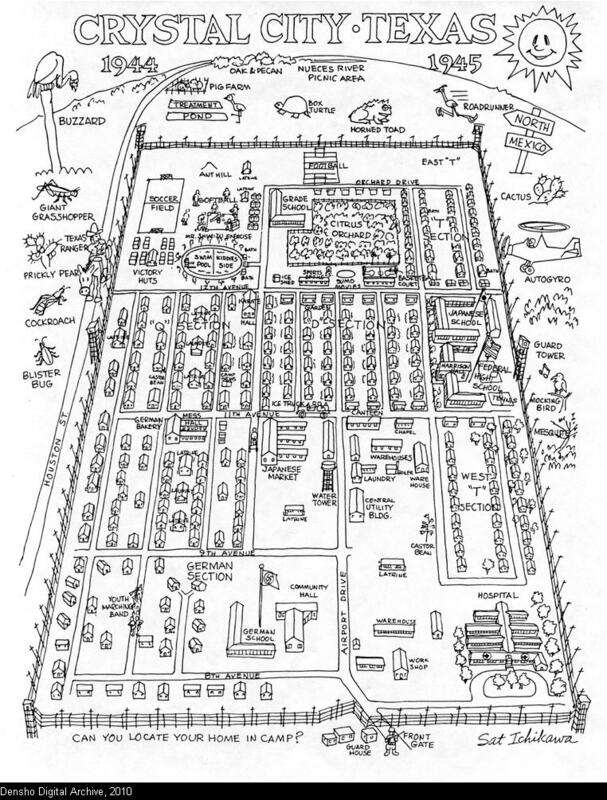 Hand-drawn map of the Crystal City Internment Camp. Image available on the Internet and included in accordance with Title 17 U.S.C. Section 107. Crystal City Internment Camp Historical Marker. Courtesy of Linda Harms Okazaki Photography. Image available on the Internet and included in accordance with Title 17 U.S.C. Section 107. Under the stimulus of agricultural growth the population rose from an estimated 800 in 1920 to 6,609 in 1930, then fell slightly to 6,529 in 1940. The majority of residents in the 1930s were Mexican or Mexican-American migrant laborers who followed a seasonal cycle of spinach in the winter, onions in the spring, and beet or cotton work in the summer and fall. A government report of 1941 estimated that 97 percent of the 5,500 Mexican Americans living in Crystal City at that time were migrant laborers. Making Crystal City their home base, most of these workers lived in slum conditions with poor services and limited educational opportunities. 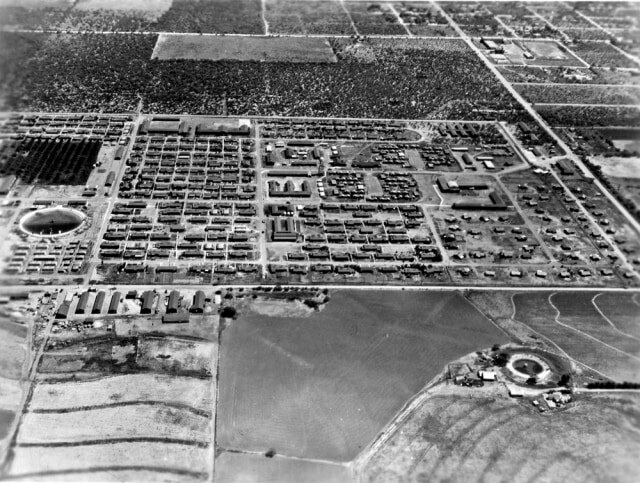 During World War II an alien internment camp was built on the site of a prewar labor camp on the edge of town. Japanese, German, and other immigrants were relocated to the camp from all over the country, and a sizable group of Japanese nationals caught by the war in the United States or in a number of South American countries were also interned at the camp. After the camp closed in 1947, the area was converted to low-rent housing, and the schools built there became part of the Crystal City ISD. In 1945 the California Packing Corporation, later the Del Monte Corporation, built an extensive canning plant just northwest of Crystal City. Since that time it has been the largest single employer in the area. The company added a can-manufacturing plant in 1958 and expanded its Crystal City facilities several times in the 1970s and 1980s. Crystal City Walk-Out in 1969. Image available on the Internet and included in accordance with Title 17 U.S.C. Section 107. The employment opportunities offered by Del Monte helped increase the population of the community to 7,195 in 1950 and 9,101, a probable all-time high for Crystal City, in 1960. The 1960s were a period of dramatic political change for the town. In spite of the fact that Mexican Americans had formed 80 percent or more of the city's population since the 1930s, the Anglo minority had kept a tight hold on city government and school administration. Frustration over several controversial attempts at urban renewal in the late 1950s and over continuing educational discrimination led to the increasing politicization of Crystal City's Hispanics. In 1963 and much more successfully in 1969, Crystal City Mexican Americans sought to gain control of key city and school-board positions in the "Crystal City Revolts". 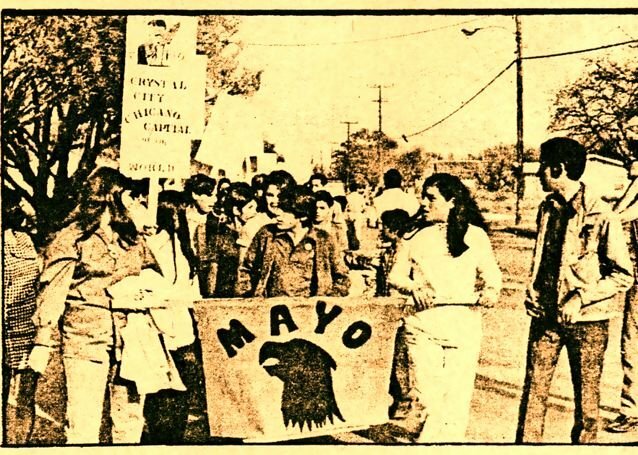 Among the important outgrowths of this political movement was the formation of the Raza Unida party in 1970, which soon assumed statewide importance and dominated Crystal City politics until it splintered into factions in 1977. These political changes had a deep impact on the ethnic composition of Crystal City's government. Before 1971, with only a single exception, only Anglos had been selected as city managers, while from 1971 through the 1980s only Mexican Americans held that position. Similarly, the school superintendents had all been Anglo from 1908 to 1971, and from 1971 to 1990 they were all Mexican American. After Mexican Americans secured control of the city public schools in 1970, most Anglo students withdrew to private schools, and the public schools were 98 percent Mexican American through the 1980s. The population declined somewhat during the 1960s, to 8,104 in 1970, and remained relatively static through the 1980s. In 1990 Crystal City's 8,263 residents represented almost 70 percent of the county population. The annual November spinach festival, which was halted by World War II, was resumed in 1982. David Montejano, Anglos and Mexicans in the Making of Texas, 1836–1986 (Austin: University of Texas Press, 1987). John Staples Shockley, Chicano Revolt in a Texas Town (Notre Dame, Indiana: University of Notre Dame Press, 1974). Zavala County Historical Commission, Now and Then in Zavala County (Crystal City, Texas, 1985). Jan Jarboe Russell, The Train to Crystal City: FDR's Secret Prisoner Exchange Program and America's Only Family Internment Camp During World War II (New York: Scribner, 2015). Handbook of Texas Online, Mark Odintz, "CRYSTAL CITY, TX," accessed April 21, 2019, http://www.tshaonline.org/handbook/online/articles/hfc17. Uploaded on June 12, 2010. Modified on April 18, 2016. Published by the Texas State Historical Association.